Norfolk Stairlifts is the only company in the county to offer our unique 'rent-a-stairlift' service. – With a standard installation charge of £350. And the great news is that you also recieve two months rental included in the installation fee. Notes: Manual hinged rails available (Additional one off fee of £70). Prices are subject to a full site survey. All prices include installation and warranty but exclude VAT as this may by zero rated. A declaration stating a disability or illness will be required. Other makes and models are used depending on what stock is available. Reconditioned stairlifts are used for renting. Why Do People Rent A Stairlift! Rent is Rent: Your monthly rent is predictable and consistent. You know exactly how much you are paying each month. A new stairlift can be a large sum of money to outlay in one go. So even in the long term renting offers your financial stability. Great for the Short Term: Do you need a stairlift for the short term perhaps one whilst a relative is staying at your home? Renting a stairlift is a great solution in the short term. Maintenance is your Friend: If something should go wrong with your stairlift then we are on hand to fix it 365days per year. Easily Removable: Should the time come when your stairlift is no longer required then all you do is call us and we will remove it quickly and with the minimum of disruption. 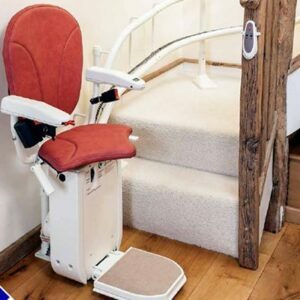 You won’t be left wondering what to do with a purchased stairlift. Less Stressful: With stress, we can all agree that less is more. Renting is simple and hassle free. Norfolk Stairlifts is the only company in the county to offer our unique ‘rent-a-stairlift’ service. £50.00 per calendar month. Paid monthly. Two months rental included in the installation fee. Standard Installation Charge: £350. Manual hinged rails available (Installation charge £420). Breakdown call outs 365 days per year. 9am – 10pm service. Maintenance included. Call-outs, parts and labour all included. Responsive service. 2hr installation time. 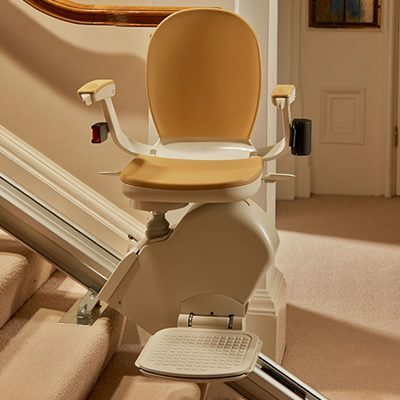 Easy to use, reliable equipment.Battery operated stairlifts fitted with a manual swivel seat. Reconditioned stairlifts are used for renting. The Brooks straight stairlifts are built to last, with low maintenance and high reliability. They run on maintenance free DC power packs, which are automatically recharged at the end of every trip. This type of power ensures that the stairlifts are safe to use, and are incredibly smooth. Brooks straight stairlifts come with all the necessary features and a few extra ones, as standard.. Important: Whilst we usually use this particular model shown for our straight stairlift rentals, we also use other makes and models depending on what stock is available. Curved stairlift rails are bespoke to each individual property. As such the initial installation charge is higher than for a mass produced straight stairlift rail. We usually use reconditioned Stannah 260 curved stairlifts fitted to a remanufactured rail. For flexibility and choice and also to maximise suitability we also offer reconditioned stairlifts from manufacturers such as Otolift and Platinum. In these cases the reconditioned stairlift would be fitted to a new rail (the installation fee may differ from the prices quoted below). -Installation charge from £1700. (this is for a Stannah 260 on a standard staircase with one 90 degree bend, 6mtrs of rail and a manually swivelling seat). – the manufacture of bespoke rail is still required for curved stairlift rental. Notes: Prices are subject to a full site survey. All prices include installation and warranty but exclude VAT as this may by zero rated. A declaration stating a disability or illness will be required. Varying makes and models are used depending on what stock is available and what your bespoke requirements are. Reconditioned stairlifts are used for renting. From the Norfolk Stairlifts head office, just 15 miles from Norwich, we stock a large range of stairlifts including straight stairlifts, curved stairlifts and reconditioned stairlifts. Norfolk Stairlifts is an independent company that installs stairlifts throughout Norfolk and Suffolk. As the leading stairlift company in East Anglia, we’re confident we can help. © 2019 Norfolk Stairlifts.This website was funded by a grant from the New Anglia Local Enterprise Partnership, through the Small Grant Scheme. www.newangliagrowthhub.co.uk or call: 0300 333 6536. Registered in England & Wales No. 05981711 Is Authorised and regulated by the Financial Conduct Authority (FCA) for the business of Consumer Hire. Full details of the FOS can be found on its website at www.financial-ombudsman.org.uk.